Animallike robot companions such as robotic seal Paro are increasingly used in dementia care due to the positive effects that interaction with these robots can have on the well-being of these patients. Touch is one of the most important interaction modalities for patients with dementia and can be a natural way to interact with animallike robots. To advance the development of animallike robots, we explored in what ways people with dementia could benefit from interaction with an animallike robot with more advanced touch recognition capabilities and which touch gestures would be important in their interaction with Paro. In addition, we explored which other target groups might benefit from interaction with animallike robots with more advanced interaction capabilities. In this study, we administered a questionnaire and conducted interviews with two groups of health-care providers who all worked in a geriatric psychiatry department. One group used Paro in their work (i.e., the expert group; n = 5) while the other group had no experience with the use of animallike robot (i.e., the layman group; n = 4). The results showed that health-care providers perceived Paro as an effective intervention to improve the well-being of people with dementia. Examples of usages for Paro that were mentioned were providing distraction, interrupting problematic behaviors, and stimulating communication. Furthermore, the care providers indicated that people with dementia (would) use mostly positive forms of touch and speech to interact with Paro. Paro’s auditory responses were criticized because they can overstimulate the patients. In addition, the care providers argued that social interactions with Paro are currently limited and therefore the robot does not meet the needs of a broader audience such as healthy elderly people who still live in their own homes. The development of robot pets with more advanced social capabilities such as touch and speech recognition might result in more intelligent interactions, which could help to better adapt to the needs of people with dementia and could make interactions more interesting for a broader audience. Moreover, the robot’s response modalities and its appearance should match the needs of to the target group. Social robots such as animallike robot companions are increasingly being used in health care (e.g., Wada and Shibata, 2007; Shibata and Wada, 2010; Bemelmans et al., 2012, 2013; Kachouie et al., 2014). Research shows that interaction with animallike robots can have positive effects similar to those from interaction with real animals (e.g., Eachus, 2001; Wada and Shibata, 2007; Banks et al., 2008; Bernabei et al., 2013; Robinson et al., 2015; Sefidgar et al., 2016). Moreover, robots have advantages compared to real animals: their behavior can be better controlled; they do not carry diseases; and they need less care (Eachus, 2001; Filan and Llewellyn-Jones, 2006; Shibata and Wada, 2010). These advantages are especially important when working with a vulnerable population such as the elderly. When interacting with real animals, touch is one of the most used forms of interaction. Furthermore, recent studies point to the benefits of touch interaction in robot therapy (Robinson et al., 2015; Sefidgar et al., 2016). However, currently commercially available animallike companion robots such as robot seal Paro (Shibata and Wada, 2010) and Sony’s robotic dog AIBO (Fujita, 2001) do not focus specifically on touch interaction, which seems like a missed opportunity. Paro is one of the most researched animallike robots and one that is quite often implemented in regular care (Shibata and Wada, 2010; Bemelmans et al., 2012; Kachouie et al., 2014; Robinson et al., 2015). It was developed in Japan for robot therapy and is mostly used with children and people with dementia (Wada et al., 2004, 2005; Wada and Shibata, 2007; Shibata and Wada, 2010; Bemelmans et al., 2015, 2016). Paro is equipped with touch sensors but does not recognize or interpret different touch gestures (Wada and Shibata, 2007). Instead, the robot distinguishes between positive (i.e., soft) and negative (i.e., rough) touches. However, research indicates that people use mostly positive forms of touch when interacting with another human (Jones and Yarbrough, 1985) or a robot pet (Yohanan and MacLean, 2012). Furthermore, these positive forms of touch can have different meanings depending on the context, for example, the intent of a touch could be affectionate, comforting/supportive, or playful (Jones and Yarbrough, 1985; Yohanan and MacLean, 2012). In addition, an other study showed that the social message that was communicated to a robot pet varied based on the user’s emotional state, which also affected the response that was expected from the pet (Jung et al., 2017). Based on these findings it is therefore likely that recognizing and acting on these different meanings will benefit interaction with animallike robots. The focus of this study will be on the use of touch in the interaction with animallike robot companions. In this study, we will consult health-care providers to explore whether people with dementia would benefit from interaction with an animallike robot with more advanced touch recognition capabilities. Dementia is a global, progressive, and chronic condition, in which there are severe impairments in a person’s ability to think, reason, and remember (World Health Organization, 1993). Dementia has been recognized by the WHO as a public health-care priority because of the increase in the number of people living with dementia due to the aging population and the enormous burden this places on the health-care system (World Health Organization, 2012). To keep the costs of dementia care manageable and the quality of care high, innovative solutions are needed. The use of (animallike) robots is one of these solutions (Bemelmans et al., 2012; Kachouie et al., 2014). In addition, enabling these animallike robots to understand and respond to human touch might be a way to further improve the effects of these robots in dementia care as touch is one of the most important interaction modalities in patients with dementia. As the disease progresses, verbal communication becomes harder for these patients and non-verbal interaction, especially touch, plays a prominent role in care, for instance, for communicating messages of comfort and safety (Barnett, 1970; Powell, 2000). In this study, we administered questionnaires and conducted interviews with two groups of health-care providers in dementia care: a group that worked with Paro and a group that had no experience with the use of animallike robots. We will address the following research questions to inform the development of animallike robot companions that can understand and respond to human touch for health applications. (1) In what ways could people with dementia benefit from interaction with an animallike robot with more advanced touch recognition capabilities? (2) What types of (tactile) behaviors do/would patients with dementia use in their interactions with Paro? (3) Which other target groups could benefit from interaction with Paro or a more advanced animallike robot? The remainder of this article is structured as follows. Related work on the effectiveness of animallike robot companions in care for the elderly and touch interaction with robot pets will be discussed in the next section. Then, the material and methods for the presented study will be described. The results will be presented and discussed in the subsequent sections followed by the conclusions. There are potential health benefits to be gained from interacting with an animallike robot companion. For example, a study by Banks et al. (2008) found that the company of robotic dog AIBO could be as effective as a real dog in reducing loneliness in elderly patients living in a long-term care facility. Furthermore, there are indications that stroking and interacting with Paro could lower blood pressure in elderly people, which is similar to the effects found for interaction with real animals (Eachus, 2001; Robinson et al., 2015). In another body of work, elderly people (including people in various stages of dementia) in different care facilities freely interacted with Paro for either a couple of weeks (Wada et al., 2004; Wada and Shibata, 2007) or up to 1 year (Wada et al., 2005). The results of these studies indicated that interaction with the robot pet could improve mood, make people more active, lower stress, and promote social contact with the robot as well as with peers and nursing staff (Wada et al., 2004, 2005; Wada and Shibata, 2007). Furthermore, the use of Paro seemed to ease the burden on the nursing staff as their reported stress levels decreased after the robot’s introduction (Wada et al., 2004). In addition, the results showed that Paro is interesting enough for long-term interaction and proved to be durable and safe enough for long-term use (Wada et al., 2005). Systematic reviews into the effectiveness of socially assistive robots in care for the elderly found that these robots (most studies investigated robots that were animallike) have the potential to improve psychological and physiological outcomes, but the methodological quality of the existing studies is low (Bemelmans et al., 2012; Kachouie et al., 2014). Bemelmans et al. stress the need for structured interventions, similar to those used in animal-assisted therapy (Filan and Llewellyn-Jones, 2006), with measurable outcomes as without proof of the added value of robots for therapy their image of being mere entertaining gadgets might remain and reimbursement could be problematic (Bemelmans et al., 2012, 2013, 2015). Furthermore, end users (i.e., patients and care providers) should be included in the process to ensure successful adoption of robot therapy (Bemelmans et al., 2012, 2013; Kachouie et al., 2014). In an effort to study the effects of animallike robots in health care in a more structured manner, several interventions for Paro in dementia care were developed together with care providers such as nurses, activity coordinators, therapists, and medical doctors (Bemelmans et al., 2013). These interventions could be divided into three types: (1) therapeutic applications to stimulate perception, psychological functioning, psychosocial well-being, and social behavior; (2) facilitation of daily care activities by providing comfort and distraction during stressful activities; (3) support of social visits by having a shared focus point as Paro can attract attention. Based on these three types, individualized interventions were defined and tested with patients suffering from dementia in two studies (Bemelmans et al., 2015, 2016). 69 therapeutic interventions and 17 care facilitating interventions were conducted in a within-subject quasi-experimental time series ABAB study lasting 4 months, which was completed by 71 participants (Bemelmans et al., 2015). Overall, the interventions showed a significantly positive effect indicating that Paro can be a valuable tool in dementia care. In the other study, 23 participants interacted with Paro once or twice a week for a period of 3 weeks (Bemelmans et al., 2016). Of the 35 conducted interventions, 19 were therapeutic interventions, 7 were to facilitate care, and 9 were to support social visits. Care providers considered the majority of the interventions to be feasible (26 out of 35) and of added value (22 out of 35). Both studies showed that Paro was most suitable for therapeutic interventions (Bemelmans et al., 2015, 2016). Compared to hard-shelled animallike robots such as AIBO (Fujita, 2001), soft fur-covered robots such as Paro and the elephant-like robot Probo are more pleasant to touch and can evoke affective behaviors such as stroking and hugging (Wada and Shibata, 2007; Saldien et al., 2010; Shibata and Wada, 2010; Robinson et al., 2015). Although most robot pets such as Paro (Wada and Shibata, 2007), AIBO (Fujita, 2001), Probo (Saldien et al., 2010), Hasbro’s companion pets,1 and JustoCat2 are equipped with some touch sensors, for a more natural interaction animallike robots should be able to automatically understand and respond to different types of touch and interpret those touches within context. In an effort to advance the automatic understanding of social touch for robots, research has been conducted on the recognition of touch gestures (e.g., stroke, pat, and tickle), emotions (e.g., happiness, fear, and sadness), and social messages (e.g., greeting, attention-getting, and showing affection) from pressure sensor data (Knight et al., 2009; Silvera-Tawil et al., 2012, 2014; Altun and MacLean, 2015; Jung et al., 2015, 2016). Recently, research labs have started to develop robot pets that focus specifically on touch interaction. For instance, the Huggable robotic teddy bear has its own full-body somatosensory system to sense and process human touch (Stiehl et al., 2005; Knight et al., 2009). Another example is the Haptic Creature that is a zoomorphic lap pet that can sense human touch all over its body and expresses itself by purring, simulated breathing, and stiffening of the ears (Yohanan and MacLean, 2012; Altun and MacLean, 2015; Sefidgar et al., 2016). In a controlled study on the potential calming effect of the Haptic Creature’s simulated breathing mechanism, participants were asked to stroke the robot with two hands while it rested on their lap with the breathing either turned on or turned off (Sefidgar et al., 2016). Heart and respiration rates decreased significantly as a result of stroking the breathing robot compared to when the robot was not breathing and self reports indicated that participants also felt calmer and happier. The use of simulated breathing for animallike robots has been explored further in the CuddleBit robots (Cang et al., 2015; Bucci et al., 2017). These small zoomorphic robots react to human touch by expressing emotions through different breathing patterns resulting in a haptic affective display. The current study will build upon previous research on the effectiveness of existing animallike robots such as Paro in health-care facilities and exploratory lab research on the development of new robots that can engage in tactile interaction. In contrast to most previous research, the purpose of this study is not to investigate the effectiveness of Paro in dementia care per se. Instead, our focus is on how people with dementia could benefit from interaction with an animallike robot companion that is able to understand and respond to different types of touch. For this study, we opted to recruit health-care providers who worked in geriatric psychiatry departments. As these health-care providers work with patients suffering from dementia on a daily basis, we expected that they would have a lot of insight into the needs of people with dementia and in what ways these patients might benefit from interaction with an animallike robot with more advanced touch recognition capabilities. The perspectives and expectations of a sample of health-care providers on the use of animallike robots with more advanced interaction capabilities in dementia care and health care in general were explored through interviews. In addition, in a questionnaire the health-care providers were asked to assess the likelihood that people with dementia would use different touch gestures to interact with an animallike robot. Paro was used as the main example of animallike robots because the robot seal is already used in Dutch care facilities. In total, 9 health-care providers from two care facilities in the eastern part of the Netherlands were recruited to participate in the study. One group of health-care providers did not have any experience with the use of animallike robots (the layman group, n = 4). These participants were recruited by one of the authors during coffee breaks. The other group of health-care providers worked at a different care facility, and these participants did have experience using Paro (the expert group, n = 5). In this case, participants were recruited via a contact person at the care facility. At the time of the interviews, Paro had been available to the expert group for 1 year. Their amount of experience with Paro differed because they cared for different patients with different needs. That is, some of the experts used Paro every day (e.g., as part of a bedtime routine for a patient who has difficulty sleeping), and others used Paro more incidentally (e.g., as a means to calm down a patient who is displaying vocally disruptive behavior). All experts had experience in using Paro for multiple goals and with multiple patients. All participants were females who had completed secondary vocational training. The age of the participants was between 30 and 52 (M = 44, SD = 10) for the layman group and between 24 and 67 (M = 46, SD = 15) for the expert group. Participants from the layman group had more years of experience working in a geriatric psychiatry department (M = 13, SD = 7) compared to the expert group (M = 5, SD = 2). 1. Vision on the use of animallike robots in health care: what are suitable target groups and for what kind of interventions can animallike robots be used? In addition, the expert group was also asked about Paro’s advantages and disadvantages. 2. Expectations of (tactile) interaction capabilities of animallike robots: which emotions or other social messages should an animallike robot communicate to a person with dementia and how should a robot communicate these? In addition, the expert group was asked which social cues Paro conveys in reaction to being touched by these patients. 3. Added value of an animallike robot with more advanced capabilities to understand and respond to social touch for patients suffering from dementia: would a more socially intelligent animallike robot be more effective and would the advancements in the robot’s capabilities affect how the robot could be used? In addition, the expert group was also asked whether Paro’s interaction capabilities were perceived to be sufficient. 4. Other contexts in which animallike robots with more advanced capabilities to understand and respond to social touch could be used: which other target groups could benefit from interaction with a more socially intelligent animallike robot and how could the robot be used for these new target groups? In the questionnaire, participants were asked to rate the likelihood that people with dementia would use different touch gestures in their interaction with an animallike robot. 30 different touch gestures were rated on a 5-point Likert scale from 1 (unlikely) to 5 (likely). The list of different touch gestures was based on the “touch dictionary” from Yohanan and MacLean (2012), which consists of 30 different touch gesture labels and their definitions. For this study, the touch gestures and definitions were translated to Dutch by the authors. The participants were welcomed by the interviewer in a quiet office within the care facility where the participants worked. For practical reasons, the interviews with the participants from the expert group were conducted in two groups consisting of either two or three participants while the interviews with the participants from the layman group were conducted individually. Participants were informed about the nature of the interview and the questionnaire before signing the informed consent form. Then, the interview was conducted according to the predefined framework. The interview started by collecting demographic information followed by a video fragment of Paro, which was only shown to the layman group. During the interview, follow-up questions were asked where necessary. After the interview participants completed the questionnaire. The interviewer remained present in case clarification was needed on the questionnaire. However, none of the participants needed any help. The total duration of each session was approximately 30 min. Afterward, the participants received a small token of appreciation. The interviews were analyzed following the guidelines from Baarda et al. (2005). Transcriptions of the interviews were grouped based on topics using an inductive approach. The interview data were divided into fragments, and each fragment was assigned a label that described the content. Multiple labels could be assigned to a fragment if the fragment could not be split without losing context. For each label, the number of participants per group that mentioned the specific topic was counted, and these numbers are indicated in the results. In the results section, we will highlight the differences between groups or combine the results of both groups in cases where results were similar. The interview results are presented within themes that do not necessarily overlap with the four main topics of interview question listed in Section 3.3.1. The questionnaire data were analyzed using IBM SPSS Statistics version 22. The focus of the questionnaire was on the likelihood of the use of different touch gestures to interact with Paro. However, due to the inclusion of two groups of participants, the ratings of the layman group and the expert group were first compared by conducting Mann–Whitney U tests using Bonferroni adjusted alpha levels of 0.0017 per test (0.05/30). Exact p-values are reported for two-tailed tests. Touch gestures with a median rating of >3 were considered likely to be used, gestures with a rating of 3 were considered neutral while those with a rating of <3 were considered unlikely to be used. In addition, within each of these three categories, the touch gestures were ranked based on the summed likelihood ratings of all participants. Participants mentioned six different goals for which Paro can/could be used (see also Table 1). 1. All participants perceived Paro to be especially suitable as a means to distract patients who are restless or sad (layman: n = 4; experts: n = 5). Restless behavior was reported to often occur during the evening (layman: n = 2; experts: n = 3). 2. About half of the participants mentioned that Paro can be used to interrupt problematic behaviors (layman: n = 3; experts: n = 2), especially in cases of vocally disruptive behavior (layman: n = 2; experts: n = 1). A participant from the expert group explained that Paro can provide stimulation to confirm to the patient that he/she is still alive. 3. Five of the participants mentioned that Paro can be used to make contact with patients with severe dementia by stimulating their senses through interaction (layman: n = 3; experts: n = 2). 4. About half of the participants stated that Paro can stimulate communication both between patients and between patients and health-care providers (layman: n = 3; experts: n = 2). 5. Some of the participants mentioned that Paro can be used to support health-care providers (layman: n = 2; experts: n = 2). For example, participants from the expert group mentioned that the soothing effect of Paro can facilitate care moments (n = 1) and that Paro can provide one-on-one contact at moments when the care staff does not have the time or the manpower available to provide this individual level of contact (n = 1). The layman group also expected that Paro would support them in their work but they attributed this to the reduced need for supervision (n = 2). In contrast, participants from the expert group argued that interaction with Paro should be supervised to prevent patients from damaging Paro (n = 2) and to observe the outcome of the intervention (n = 3). 6. A few of the participants argued that Paro can be used as company to relieve feelings of loneliness (layman: n = 1; experts: n = 1). However, another participant from the layman group (n = 1) argued that she would not use Paro in this case as a robot could not replace human contact. Table 1. Goals for which Paro can/could be used according to the health-care providers. Some participants mentioned that the mere presence of Paro can already have a positive effect on people with dementia (experts: n = 2). However, the others argued that feedback from Paro is essential to achieve the desirable effect (layman: n = 4; experts: n = 3). Furthermore, according to some participants Paro’s response should be adapted to the patient’s touch (layman: n = 3). Participants indicated that Paro’s soft fur (layman: n = 2; experts: n = 2), big eyes (layman: n = 2; experts: n = 2), and auditory signals (layman: n = 1; experts: n = 2) seem to elicit care responses in the patients who in return express their love to Paro and comfort the robot (layman: n = 1; experts: n = 2). Patients display their affectionate behavior in the form of touch gestures such as stroking and hugging (layman: n = 2; experts: n = 4) and verbal expressions (experts: n = 2). According to the participants, Paro mirrors the positive interaction by conveying safety and security (layman: n = 2; experts: n = 5) and love (layman: n = 1; experts: n = 1) in the form of an auditory response (layman: n = 1; experts: n = 4) and by moving its head and fins (layman: n = 2; experts: n = 3). One of the participants from the layman group mentioned that Paro’s response subsequently seems to have a positive effect on the mood of the patients. I notice when they [the patients] hold him [Paro] against their neck, he lifts his head and as a result the whiskers move along their faces which is a very sensitive area for these people, they can feel it clearly. In addition, two of the participants mentioned that patients are able to recognize Paro’s negative response to aggressive touch gestures such as rough grabbing (experts: n = 2). For example, one of these experts recalled that one of her patients had exclaimed: “oh he [Paro] doesn’t like that” in response to Paro’s negative reaction. In response to these comments, other participants complemented that the use of rough touch occurs rarely (experts: n = 2). In general, all health-care providers were positive about the use of animallike robots in dementia care. Paro was described by participants of the layman group as a promising (n = 3) and easy-to-use intervention (n = 1). Furthermore, few participants of the layman group argued that Paro could be a low maintenance (n = 1), more robust (n = 1), and more interactive (n = 1) alternative to real animals. The expert group was particularly positive about the effects that Paro has on people with dementia (n = 3). However, it was mentioned that animallike robots might not be a suitable solution for every person with dementia. Seven of the participants indicated that such a robot should fit within the patients’ perception of their environment and whether the patients will interact with an animallike robot is dependent on their affinity for animals (layman: n = 3; experts: n = 4). Moreover, some of the participants argued that the use of a robot intervention should be discussed with the patient’s family (layman: n = 2; experts: n = 1) and health-care providers should be trained to use these interventions in an effective and respectful manner (experts: n = 2). Paro’s shortcomings also came to light during the interviews. Some of the participants in the layman group argued that a robotic cat or dog might be more suitable than Paro’s seal appearance as patients might be more familiar with these animals and would feel more safe (n = 2). Also, it was mentioned by one participant that these familiar animals might elicit more reactions from the patients (layman: n = 1). Interestingly, one of the participants in the expert group stated that the form of the animallike robot does not matter as long as the robot has similar functionality as Paro. Moreover, two participants from the expert group were in general positive about Paro’s endearing appearance although, at first, they were skeptical about the seal-like design as well. In addition, some remarks were made about the auditory responses of Paro, which do not seem to be the best fit for this target group. Two participants from the expert group described the responses as repetitive, irritating, too loud, and too high-pitched, which can overstimulate the patients, especially in a group setting (n = 2). Also, the feel of Paro was discussed. Paro was perceived to be not pliable enough by some of the participants (experts: n = 3) especially on its underside as the hard internal structure can be felt through the fur. Moreover, Paro’s body was described as being too rigid. However, in spite of the aforementioned shortcomings, Paro was described as being a sufficiently effective intervention for people suffering from dementia. When asked, almost all participants answered that Paro does not need more advanced tactile interaction capabilities (layman: n = 3; experts: n = 5). Some participants argued that additional stimuli might overstimulate the patients (layman: n = 1; experts: n = 2). The most frequently mentioned alternative target groups for which Paro could be a suitable intervention were people with an intellectual disability (layman: n = 3; experts: n = 2) and children (layman: n = 2; experts: n = 2). Subgroups that were specifically mentioned by some of the participants were autistic children (experts: n = 1) and those in hospitals (layman: n = 1; experts: n = 2). In the latter case, it was argued that Paro could provide comfort. Notably, these groups either have reduced cognitive capabilities or their cognitive abilities are still under development. This commonality is understandable as Paro was originally designed for people with dementia. Indeed, almost all participants stated that Paro might be too childish and too simple for adults with normal cognitive health (layman: n = 4; experts: n = 4). Even within the target group of people with dementia, Paro was perceived by most participants to be especially suitable for patients with severe dementia (layman: n = 2; experts: n = 4). In addition, some participants from the expert group reported that Paro seems to be more effective for these patients compared to patients with mild dementia (n = 2). In contrast, one participant from the expert group had positive experience with the usage of Paro for a patient with a chronic physical illness who had normal cognitive abilities. In addition, some participants argued that Paro might be effective for patients with psychiatric problems as well, for example, to calm down restless patients or to reduce aggressive behavior (experts: n = 2). Participants indicated that animallike robots should be more technologically advanced to be suitable for most other target groups. Examples of target groups for more advanced animallike robots that were given by individual participants were robot pets for people with reduced mobility who are unable to care for a real animal (layman: n = 1) or in rehabilitation where people could exercise together with a robotic dog (layman: n = 1). Another potential target group that was mentioned was healthy elderly people who still live independently: in this case, a robot could help to prevent loneliness (experts: n = 1). However, this participant mentioned that the current price of Paro is a limiting factor for the wide adoption of robot companions for personal use. Moreover, it was argued that a more advanced robot could improve mental health by starting conversations to help people open up about repressed emotions (layman: n = 1). Two participants mentioned that in general, as with all target groups, it will depend on the person whether he/she will benefit from interaction with a robot companion (layman: n = 2). The likelihood ratings for the use of different touch gestures did not differ significantly between the expert and layman groups (all p’s ≥ 0.048). The data of both groups were therefore combined and divided into three categories based on the median ratings of the likelihood that people with dementia would use the touch gestures in their interaction with an animallike robot (see Table 2). 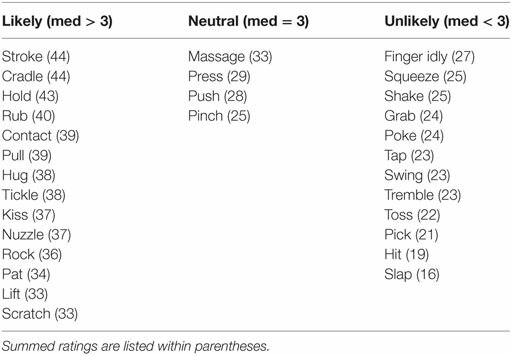 The touch gestures are ranked within each column based on the summed ratings of all participants, which ranged from 9 to 45 as 9 participants rated each touch gesture on a scale from 1 to 5. Notably, the touch gestures that were rated to be most likely (i.e., stroke, cradle, and hold) were positively natured while the least likely gestures (i.e., slap, hit, and pick) were of a more negative nature. Table 2. Likelihood that people with dementia would use different touch gestures in their interaction with an animallike robot according to health-care providers. The health-care providers perceived that interaction with Paro could increase the well-being of people with dementia. According to Keyes (2002), mental health is more than the absence of mental illness, it comprises of three components: emotional, psychological, and social well-being. Emotional well-being is the presence of positive emotions and the absence of negative emotions (Keyes, 2002). The interviews indicate that interaction with Paro could induce a positive affective state such as calmness and could reduce negative emotions such as sadness. In addition, the results show that Paro could stimulate communication between patients as well as between patients and health-care providers. As positive relations with others contribute to psychological well-being (Keyes, 2002), Paro is perceived to improve well-being in this area as well. Both findings are in agreement with the results from literature reviews on the effects of social robots in care for the elderly (Bemelmans et al., 2012; Kachouie et al., 2014). However, from this study it is unclear to what extent Paro could improve the social well-being of people with dementia, which refers to how a person functions within society. Improving social well-being seems to be especially important for elderly people who are still aware of their participation within society and/or those who still live independently. Animallike robots such as Paro could help elderly people to stay connected by updating them about recent events. An existing example is Nabaztag, a rabbit-shaped robot with an Internet connection through which users can have access to news and social media (Kachouie et al., 2014). In future work, the short- and long-term effects of animallike robots on different aspects of well-being can be assessed through questionnaires such as the Mental Health Continuum-Short Form (MHC-SF) (Lamers et al., 2011). During the interviews health-care providers mentioned that they felt that Paro (would) support(s) them in their work due to its positive behavioral and psychological effects. In Bemelmans et al. (2013), similar expectations were mentioned, and Wada et al. (2004) reported a reduction in the stress levels of the health-care providers due to the reduced need for supervision when the elderly people interacted with Paro. Some of the participants from the layman group also expected this reduction in the need for supervision. In contrast, participants from the expert group indicated that they often intentionally stayed with the patient to observe and evaluate the effect of Paro. In addition, some of the participants from the expert group stated that due to the costliness of the Paro robot and the unpredictable behavior of the people with dementia, the possibility of unsupervised interaction with Paro was assessed on an individual basis. The use of animallike robot companions to reduce loneliness was only mentioned by a few participants while literature reviews indicate that this is a goal for which both real animals (Bernabei et al., 2013) and animallike robots are frequently used (Bemelmans et al., 2012; Kachouie et al., 2014). Meanwhile, the use of robots in care for the elderly has sparked a debate about several ethical issues including whether robots will reduce the need for human contact or could even replace humans in the future. Although the participants were not specifically asked about these ethical issues, some of the care providers made comments related to this topic during the interviews. For example, one of the participants stated that she was against the use of Paro to relieve feelings of loneliness as a robot cannot replace human contact. Similarly, Sparrow and Sparrow (2006) argued that robots can merely simulate affection, concern, and friendship as these robots are unable to engage in genuine social interaction. For this reason, they stated that it is a form of deception to let elderly people believe that they are loved and cared for by a robot. In addition, participants mentioned that adults with normal cognitive health might not feel that they are being taken seriously if they were given the opportunity to interact with an animallike robot. Nevertheless, it was also reported that a patient with a chronic physical illness, who had normal cognitive abilities, liked to interact with Paro in spite of knowing that it was not a real animal. In this case, there was no form of deception as described by Sparrow and Sparrow (2006). Instead, this case seems in agreement with the view of Sharkey and Sharkey (2012) who argued that there are more explanations for why someone would interact with a robot besides being the victim of deceit as people are often willing to interact with an object as if it was a living creature. This argument is supported by the theory that states that people generally treat computers as social actors (Nass et al., 1994). With respect to the use of Paro for people with dementia, the participants of this study seem to accept the fact that these patients might see Paro as a living animal and might form a connection with it. From the interviews it became clear that the expert group mostly used Paro in targeted interventions and less often as a means to just keep elderly people company. Despite the ethical considerations, the health-care providers in this study perceived Paro as a valuable tool to improve the well-being of people with dementia. Moreover, it was mentioned that, due to the sensitivity of the matter, the use of Paro should always be discussed in advance with the patient’s relatives. When directly asked during the interviews, the health-care providers indicated that Paro, with its current capabilities, is a sufficiently effective tool for interventions in dementia care. Nevertheless, during the interviews some shortcomings of Paro came to light and even a few additional functionalities were proposed. This discrepancy could be due to the lack of experience with other social robots and insufficient knowledge of available technological options. We will discuss the insights gained from this indirect information that was provided during the interviews by reviewing how people with dementia (could) interact with Paro according to the health-care providers. The participants indicated that Paro is/would be able to initiate interaction due to its tactile (softness), visual, and auditory cues, which can elicit caring responses from people with dementia. Patients are reported/expected to comfort Paro and show affection by touching the robot seal using positive and affective forms of touch and by talking to it. The predominant use of friendly touch gestures in interactions with a robotic pet was also found in a study with a healthy user group by Yohanan and MacLean (2012). It was indicated by some of the care providers that the use of negative touch gestures by the patients with dementia was often accidental, for example, grabbing hold of Paro a bit too roughly. While Paro is able to distinguish between positive and negative forms of touch, the robot does not distinguish between different forms of positive touch which is the predominant method of interaction. Indeed, Yohanan and MacLean (2012) showed that positively natured touch can be used to convey different intentions to an animallike robot, that is: protective, comforting, restful, affectionate, and playful. Taking these various intentions into account could avoid mistakes such as a robot reacting negatively to a playful, yet slightly rough, touch interaction (e.g., tossing). If Paro was able to better understand the intention behind an interaction the robot could adapt its response to the patient’s need (Jung et al., 2017). More research into the automatic recognition and interpretation of social touch will be necessary to make the robot’s behavior more socially intelligent. Direct observations of elderly people interacting with an animallike robot will help to further inform to which different types of touch the robot should be able to respond. Moreover, as people with dementia are also reported/expected to use speech in their interaction with Paro, speech (emotion) recognition might also help to interpret their intentions (El Ayadi et al., 2011). Paro’s auditory responses were criticized by some of the experts as they can overstimulate the patients and can cause annoyance to the health-care providers. In Robinson et al. (2013), similar critique was expressed by relatives and health-care providers. Paro has a built-in volume control function that can be operated using a tiny screwdriver. However, it seems that the participants from the expert group were not aware of this functionality. In addition, adjusting the volume has to be done by the health-care providers and requires the use of a special tool, which increases the burden of the care providers when working with Paro. The health-care providers will have to control for overstimulation, especially when working in groups, which is not desirable. It might be more desirable if Paro’s auditory response could be automatically adjusted to the social context, for example, by using sensors. Furthermore, not only the volume of the auditory response seems to contribute to the overstimulation and annoyance mentioned by some of the experts. The high pitch and repetitiveness were also part of the critique on the auditory response of Paro. Tactile responses such as a simulated heartbeat, as suggested by some of the participants in this study, or breathing (e.g., see Bucci et al. (2017)) might serve as a more suitable alternative. Paro’s current use of tactile responses consists of (accidental) physical contact during its movements. Simulated breathing could be a valuable additional response as it has been found to have a calming effect on the person who is interacting with a robot pet (Sefidgar et al., 2016). Furthermore, tactile responses might be less intrusive for others compared to auditory responses. More research will be necessary to find the best suitable combination of multimodal cues and responses for interaction between people with dementia and an animallike robot. The way that patients interact with Paro might be influenced by their previous interactions with pets. Some participants argued that a dog or cat design might therefore be more suitable as these are more familiar animals. However, the developers of Paro deliberately opted for an appearance of a less familiar animal to reduce the chances that the robot could not live up to the user’s expectations (Shibata and Wada, 2010). For similar reasons, others opted for zoomorphic robots with a minimalistic appearance (Yohanan and MacLean, 2012; Bucci et al., 2017). Currently, it is unclear which design would be the most suitable for elderly people with dementia. Therefore, the advantage that a familiar appearance can have by relating to previous experiences versus the risk of unmet expectations in this specific target group could be the focus of future research. In its current form, Paro is perceived to be suitable for children and people with an intellectual disability. Indeed, Paro has previously been used for robot therapy with hospitalized children (Shibata et al., 2001). Most participants argued that companion robots should have more advanced capabilities to be suitable for a more general audience. As the world’s population is aging rapidly and elderly people tend to live longer independently, social robots can be used to assist these people (Broadbent et al., 2009; Hutson et al., 2011; Kachouie et al., 2014). Service robots such as the Care-O-bot (Graf et al., 2009) can support elderly people in their everyday activities (e.g., eating and taking medication) and companion robots can be used to enhance their well-being (Broadbent et al., 2009; Kachouie et al., 2014). To develop animallike companion robots that are suitable for healthy elderly people who still live in their own home, more research into their needs will be necessary. Matching the needs of a target group is important to increase the chance that users will accept the technology (Broadbent et al., 2009). For example, previous research shows that social robots should not negatively affect the self-image of elderly people (e.g., making them feel disabled and dependent) and that the robot’s appearance should be serious instead of toy-like (Broadbent et al., 2009; Hutson et al., 2011). The sample size of the study is small and consists of female participants who share a similar educational background and occupation. Therefore, the results should be interpreted with caution as the findings of this study might not be generalizable. We deliberately recruited health-care providers because of their vast experience with the daily care of people with dementia. However, other stakeholders such as patients and their relatives might have different experiences and visions regarding the use of animallike robot companions and desirable forms of interaction with these robots. In addition, it should be noted that there might be a bias in our sample of recruited health-care providers. All participants were generally positive about Paro, which might have influenced their decision to agree to take part in our study. In this study, we opted to use Paro as the main example of an animallike robot companion for both groups because the expert group already had experience with the robot seal. None of the participants had any previous experience with other social robots. Although the interviews were also set up to explore animallike robot companions in general it is unclear to which degree the results are applicable to other robots. Moreover, participants that had no experience with Paro (i.e., the layman group) were shown a video of the robot. As a result, it might have been more difficult for these participants to judge the capabilities of Paro without seeing and interacting with the robot. In future studies, it might therefore be valuable to give health-care providers a broader overview of existing robot technology by introducing them to a range of different robots and prototypes similar to the approach taken by Hutson et al. (2011). The aim of this study was to inform the development of animallike robot companions that can understand and respond to human touch. Such robots might be able to better suit the needs of people with dementia for which touch is an especially important interaction modality. In addition, robots with more advanced interaction capabilities might also be more suitable for other target groups. For this study, two groups of health-care providers in dementia care were recruited. One group worked with robot seal Paro, and the other group did not have any experience with the use of animallike robots. Through interviews and a questionnaire, we explored in what ways people with dementia could benefit from interaction with an animallike robot with more advanced touch recognition capabilities, how people with dementia (would) interact with Paro (using touch gestures), and which other target groups could benefit from interaction with Paro or an animallike robot with more advanced interaction capabilities. Interaction with Paro was perceived by the health-care providers as an effective intervention that can help to improve the well-being of people with dementia. For example, interaction with Paro could provide distraction, could interrupt problematic behaviors, and could stimulate communication. Furthermore, our findings indicated that people with dementia were reported/expected to mostly use positive forms of touch and speech to interact with Paro. However, Paro’s ability to recognize and interpret different types of touch is limited, and the social context is not taken into account. Responding to different touch gestures that were reported to be important during interaction such as stroke, cradle, and hug might already result in more effective communication with Paro. Moreover, Paro’s auditory responses were perceived to be unsuitable for patients with dementia because of the risk of overstimulation. Therefore, more subtle haptic responses such as breathing patterns or a heartbeat might be a valuable addition to Paro’s interaction repertoire. In addition, Paro was perceived to be most suitable for specific target groups such as people with dementia and young children due to its limited interaction abilities. Robot pet companions with more advanced social capabilities such as the ability to have a conversation might better fit the needs of other target groups such as healthy elderly people who still live independently. Additional research will be necessary to determine both the short- and long-term effects of interaction with animallike robots on different aspects of well-being. Furthermore, the development of robot pets with more advanced interaction capabilities such as touch and speech recognition might result in more intelligent interactions, which could help to better adapt to the needs of people with dementia and could make interactions more interesting for a broader audience. Moreover, to further improve interactions with animallike robot companions, future studies should explore which forms of robot response modalities (e.g., sounds, movements, or breathing patterns) and appearance best suit the target group. This study was carried out in accordance with the recommendations of the ethics committee of the Faculty of Behavioural, Management and Social Sciences of the University of Twente with written informed consent from all subjects. All subjects gave written informed consent in accordance with the Declaration of Helsinki. The protocol was approved by the ethics committee of the Faculty of Behavioural, Management and Social Sciences of the University of Twente. LL designed the study with assistance from MJ and SK. LL collected the data. LL and MJ analyzed the results with assistance from SK. MJ wrote the manuscript with contributions from LL and SK. All the authors reviewed and approved the manuscript. This publication is based on the master’s thesis of van der Leij (2016) and was supported by the Dutch national program COMMIT. Baarda, D. B., de Goede, M. P. M., and Teunissen, J. (2005). Basisboek kwalitatief onderzoek. handleiding voor het opzetten en uitvoeren van kwalitatief onderzoek. Groningen: Wolters Noordhoff. Bucci, P., Cang, X. L., Valair, A., Marino, D., Tseng, L., Jung, M. M., et al. (2017). “Sketching cuddlebits: coupled prototyping of body and behaviour for an affective robot pet,” in Proceedings of the SIGCHI Conference on Human Factors in Computing Systems (CHI) (Denver, CO), 3681–3692. Cang, X. L., Bucci, P., and MacLean, K. E. (2015). “Cuddlebits: friendly, low-cost furballs that respond to touch,” in Proceedings of the International Conference on Multimodal Interaction (ICMI) (Seattle, WA), 365–366. Graf, B., Reiser, U., Hägele, M., Mauz, K., and Klein, P. (2009). “Robotic home assistant care-o-bot® 3-product vision and innovation platform,” in Proceedings of the Workshop on Advanced Robotics and its Social Impacts (ARSO) (Tokyo, Japan), 139–144. Hutson, S., Lim, S. L., Bentley, P. J., Bianchi-Berthouze, N., and Bowling, A. (2011). “Investigating the suitability of social robots for the wellbeing of the elderly,” in Proceedings of the International Conference on Affective Computing and Intelligent Interaction (ACII) (Memphis, TN), 578–587. Jung, M. M., Cang, X. L., Poel, M., and MacLean, K. E. (2015). “Touch challenge ’15: recognizing social touch gestures,” in Proceedings of the International Conference on Multimodal Interaction (ICMI) (Seattle, WA), 387–390. Knight, H., Toscano, R., Stiehl, W. D., Chang, A., Wang, Y., and Breazeal, C. (2009). “Real-time social touch gesture recognition for sensate robots,” in Proceedings of the International Conference on Intelligent Robots and Systems (IROS) (St. Louis, MO), 3715–3720. Nass, C., Steuer, J., and Tauber, E. R. (1994). “Computers are social actors,” in Proceedings of the SIGCHI Conference on Human Factors in Computing Systems (CHI) (Boston, MA), 72–78. Shibata, T., Mitsui, T., Wada, K., Touda, A., Kumasaka, T., Tagami, K., et al. (2001). “Mental commit robot and its application to therapy of children,” in Proceedings of International Conference on Advanced Intelligent Mechatronics, Vol. 2 (Como, Italy), 1053–1058. Stiehl, W. D., Lieberman, J., Breazeal, C., Basel, L., Lalla, L., and Wolf, M. (2005). “Design of a therapeutic robotic companion for relational, affective touch,” in Proceedings of International Workshop on Robot and Human Interactive Communication (ROMAN) (Nashville, TN), 408–415. van der Leij, L. (2016). Robotdieren in de ouderenzorg: een verkennend onderzoek naar de toegevoegde waarde van het verfijnen van tactiele interactie. Master’s thesis, University of Twente, Enschede, The Netherlands. Wada, K., Shibata, T., Saito, T., Sakamoto, K., and Tanie, K. (2005). “Psychological and social effects of one year robot assisted activity on elderly people at a health service facility for the aged,” in Proceedings of the International Conference on Robotics and Automation (ICRA) (Barcelona, Spain), 2785–2790. World Health Organization. (1993). The ICD-10 Classification of Mental and Behavioural Disorders: Diagnostic Criteria for Research. Geneva: World Health Organization. World Health Organization. (2012). Dementia: A Public Health Priority. Geneva: World Health Organization. Copyright: © 2017 Jung, van der Leij and Kelders. This is an open-access article distributed under the terms of the Creative Commons Attribution License (CC BY). The use, distribution or reproduction in other forums is permitted, provided the original author(s) or licensor are credited and that the original publication in this journal is cited, in accordance with accepted academic practice. No use, distribution or reproduction is permitted which does not comply with these terms.